In the last post I mentioned that Timbuktu’s location near the Niger River made it the place “where the camel meets the canoe.” In Barth’s day those canoes landed at Kabara, a village on the Niger about eight miles from Timbuktu. Barth disembarked there after spending several days in a dugout, winding through the tributaries and channels that spill into the Niger from the south, upstream from the village. At Kabara he left the river and rode through the desert to Timbuktu. In those days thieves made a good living on the road that connected the two places. These days a traveler coming from Kabara passes an agricultural project run by an evangelical sect, a small modern airport, an encampment of Bela (formerly the black slaves of Tuaregs), then a spot where people dig clay for bricks. Closer to Timbuktu a traveler reaches the mega-compound of Muammar Qaddafi, the Libyan despot. Some years ago, to the bewilderment of the locals, Qaddafi developed a fondness for Timbuktu, built the compound, and visited infrequently. He also connected his palace to the Niger with a canal, which some residents blame for Timbuktu’s mosquitoes. Qaddafi is gone but the irritants he attracted remain, in small numbers. Some things about the road haven’t changed. It’s still a sun-baked straight line from river to town. Alongside it, people still rest in slivers of shade cast by stunted trees. Donkeys and their keepers still move briskly between the Niger and Timbuktu. Heading towards the port, the donkeys carry nothing. Heading towards town, they nearly disappear beneath their wide loads of millet stalks or river grass, sold for fodder in the markets. When Barth reached Kabara the rainy season had started and the port was bustling. Barth was posing as a Syrian sherif. The people in Kabara were split between curiosity and suspicion about him. He wasn’t sure how long his disguise would hold, or what would happen to him once he entered Timbuktu. He spent a few anxious days in the village while his guide, a devious rascal, tried to arrange protection in town. When I visited Kabara, its harbor basin was somnolent and empty of vessels. The only action was four women washing clothes, as their kids loitered and fished nearby. My guide, a young Songhai named Mahamane Hameye, explained that Kabara used to be busy but its harbor began disappearing in the dry season, so boats couldn’t reach it. Now most river traffic prefers to land at Korioume, a couple of miles upstream. Part of the road to Korioume was generously shaded by eucalyptus trees. Rice and vegetables grew alongside. All this green, so close to the desert, was visually jarring. Korioume more closely resembled the scene Barth saw in Kabara. The Niger looked at least a mile wide, the “noble stream” of so many accounts of exploration. Millet grew on islands far out in the river. Soldiers waiting for the ferry flirted with women doing laundry. Traders, trucks, cargo, and boats of various sizes crowded the waterfront—dugouts painted with geometric designs, fishing boats with big square nets, the big canopied boats called pinasses that carry cargo and passengers between Gao and Mopti, other port towns on the Niger. “Something comes and something goes,” said Mahamane. Today one of the things going was slabs of salt, probably from Taoudeni, lined up on the shore. In the dry season, when the river thinned, hippos came near here and sometimes threatened the smaller boats. Within minutes of leaving Korioume, we were back in the sand and scrub of the Sahara, and the Niger was a fading green dream. Unlike Kano or Kukawa, Timbuktu created few goods of its own. Its prosperity stemmed from its location. Though surrounded by the Sahara, it sat only eight miles north of the Niger, on the big bend where the river juts into the desert. Barth was in Timbuktu during the river’s annual flood stage, and was amazed to see streams rushing through the desert near the town. Timbuktu was the place “where the camel meets the canoe,” a place of traders and middle-men. Gold arrived from mines in the tropical south and was traded for salt from mines in the desert north. Two or three times a year Tuaregs and Berabish from Timbuktu made the brutal caravan journey 500 miles straight north into the Sahara to the salt mines of Taoudeni, a desolate hellhole where slaves labored and died. “It is hardly possible that even under the most merciless regimes,” wrote E. F. Gautier in his classic Sahara: the Great Desert, “there has ever been an industrial hell comparable to this one anywhere on the face of the earth.” The round trip took four to six weeks. The caravans returned with large grayish slabs of salt, rare and hence pricey. Salt traders still make the journey to Taoudeni, though now they often ride trucks instead of camels. By the time Barth reached Timbuktu he was no longer amazed by the variety found in African markets far from the coasts. Europeans considered Timbuktu inconceivably remote, but shoppers there could find goods from all over Europe as well as Africa. First-time visitors who arrived from the desert must have been shocked to find fresh vegetables and fruits for sale so close to the Sahara—another benefit of the town’s proximity to the Niger. Now as then, customers in Timbuktu’s markets haggle over tomatoes, carrots, cabbages, yams, eggplants, rice, peppers, beans, okra, and peanuts—all grown along the Niger—as well as salt, camel cheese, live chickens, slabs of beef or goat, and new items such as CDs, jeans, and flip-flops. In Timbuktu I stayed on the town’s northern edge at a small guest house called Sahara Passion. It offered several simple, pleasant rooms. From the rooftop terrace I could watch small caravans approaching from the desert or heading into the sands. The Sahara Passion’s rooms are within the walled home of its owners, Shindouk Mohamed Lamine and his wife Miranda Dodd, who came to Africa from Whycocomagh, Nova Scotia as a Peace Corps volunteer and stayed to make a life with Shindouk. Like his father and grandfather before him, Shindouk is the chief of a Berabish tribe, the Oulad Najim, one of several factions of a larger tribe, the Oulad Driss. His father was renowned for his knowledge of the desert and saved many stranded people. Once, the story goes, a man who had collected sand from all over the desert showed his samples to Shindouk’s father and challenged him to identify them. Shindouk’s father peered, rubbed, tasted, and pinpointed every sample’s original location. Shindouk’s father and grandfather were salt traders. Shindouk first made the trip to Taoudeni when he was 13. His duties were to get up early, start a fire, make tea, and find the camels. These elements—tea, fire, camels, desert, salt—seem genetically programmed into men such as Shindouk. On his first trip outside the desert, to a conference sponsored by the United Nations, he had a layover in Paris’s Charles de Gaulle airport. He unpacked his small charcoal burner and built a fire to make the sweet tea that no desert man can live without for long. He was surprised to find himself quickly surrounded by men with guns. Every night of my stay in Timbuktu, as soon as the sun went down, Shindouk put dry grass and sticks into a round shallow-sided metal disk, about the size of a large pizza pan, and started a small fire in his courtyard of sand as the huge Saharan sky glittered above. He and a friend or two sat or reclined around the fire on carpets, talking in low voices—or occasionally making calls on their cell phones. Long before the fire had turned to coals, an abandoned boy named Abdullah, whom Shindouk and Miranda had given refuge, had rolled himself into his ragged blanket to sleep on the sand in the dark beyond the fire. The Sahel endured a horrible drought in the late 1970s and early 1980s (for an excellent account of those times see Thurston Clarke’s The Last Caravan). The drought wiped out the herds of most desert peoples in Mali, Niger, and elsewhere in the Sahel, dealing a crippling blow to an ancient way of life. War followed in the 1990s. Shindouk spent five years in a refugee camp in Mauritania. This life has made him thoughtful, serious, and eager to preserve and share the knowledge that he worries is dying with the desert elders. Miranda clearly seconds his respect for this knowledge. I was pleased to benefit from it and to be their guest. Niger River running through Sahara, with TImbuktu in upper center as a small gray oval. The town was already known for its scholars when Ibn Battuta passed through around 1352, shortly after the construction of Timbuktu’s most famous mosques, the Djingere Ber and Sankore. Sidi Yahia, the third important mosque, is the youngster, dating from the mid-1400s. Leo Africanus visited around 1510 and claimed that manuscripts and books “sold for more money than any other merchandise” in the market—probably an exaggeration, given the town’s lucrative trade in gold, salt, and slaves. But throughout the 16th century Timbuktu’s mosques and their associated schools did draw hundreds and perhaps thousands of scholars, students, and mystics from all over north central Africa and the Middle East. The scholarship focused on Islam but also encompassed mathematics, astronomy, law, geography, botany, medicine, and music. Plato, Aristotle, Ptolemy, and Hippocrates were studied in Arabic translations. Because of all the visitors, Timbuktu was a polyglot town. Scholars wrote books in Hausa, Fulfulde, Tamasheq, and Songhai as well as Arabic. Ahmed Baba, one of Timbuktu’s most learned men, wrote dozens of works in Arabic and had a library of 1,600 volumes, which he described as one of the city’s smaller collections. This golden age ended brutally in 1591 with the invasion of a mercenary army sent by the Sultan of Morocco. Their muskets shredded Timbuktu’s defenders. The town’s libraries were plundered, its scholars marched to Marrakesh and imprisoned. Timbuktu’s tradition of learning seemed demolished, its libraries obliterated. In fact the conquered inhabitants saved many manuscripts, which spent several centuries, including the years of imperial conquest and French occupation, hidden in villages, desert camps, and houses on dusty side-streets in Timbuktu. As the years passed, some owners could no longer read what they possessed, but they treasured the manuscripts as family patrimony. In the 1970s scholars began trying to find and preserve these precious relics before they were destroyed by other marauders—bugs, mold, neglect, time. These efforts gained steam over the next 30 years with help from the Ford Foundation, the government of South Africa, and other groups. Agents went into the countryside to find ancient manuscripts and to persuade their owners to sell them for the sake of preservation. Some owners were paid in cows or camels, some in cash. The result was a flood of recovered manuscripts—according to the Ford Foundation, more than 700,000 of them. I visited two of these libraries. The Ahmed Baba Institute, which was about to move into big new quarters on the site of Ahmed Baba’s old residence, holds about 30,000 manuscripts. Among the texts on display at the time of my visit were treatises from the 16th century on astronomy and mathematics, and from the 11th century on law, cataracts, and a commentary on the Qur’an. Somewhere amidst the 30,000 manuscripts, said Bouya Haidara, a commentateur at the library, was a letter in Arabic sent by Sheikh al-Bakkay to the Tuareg tribes to the east, asking them not to kill a white Christian named Heinrich Barth who was traveling through their lands. The letter was found with a family in Timbuktu. Haidara told me about another letter somewhere in the stacks from Queen Victoria, thanking al-Bakkay for helping Barth. The libraries are so overwhelmed with manuscripts that their first priorities have been preservation and cataloguing. A filing system will come later. The Mamma Haidara Library holds about 22,000 manuscripts, most of which had been cared for by a single family since the 16th century. Its oldest manuscript is a commentary on the Qur’an written on gazelle skin. The display there included poems and documents written in Arabic, Tamasheq, Songhai, Fulfulde, and Bambara between the 14th and 19th centuries, on subjects ranging from morality to chemistry, medicine, prosody, geography, physiology, logic, and inheritance laws, as well as business documents covering every sort of commodity traded between Timbuktu and Barbary, Kano, Bornu, and Egypt. Recently a new threat to Timbuktu’s patrimony has emerged. There have been reports that the fundamentalist Tuaregs who captured Timbuktu in the recent coup in Mali have looted some of the libraries, including the Ahmed Baba Institute, possibly for the purpose of selling these ancient examples of Islamic scholarship to fund their violent distortion of Islam. Barth entered Timbuktu in September 1853. He didn’t expect to stay long. When explorers make plans, the gods snicker. He got stuck in Timbuktu and environs for eight months. For much of that time he was under a death threat. He would have been expelled and probably killed if not for his protector, Ahmed al-Bakkay, Sheikh of Timbuktu, who risked his own life to defend Barth’s. The house where al-Bakkay lodged the explorer is now a private residence on the Rue Heinrich Barth. A plaque commemorates it. A small front room in the house has been designated as a museum open to the public, admission about $2. The room features several small pictures of Barth, some placards in English, French, and German about the explorer’s accomplishments and significance, and a poster-map of the route, with small portraits of the expedition’s four Europeans. A five-volume German edition of Travels and Discoveries sits behind glass on a shelf. The room is probably mildly interesting to people who have never heard of Barth, but to me it was all familiar and hence disappointing. Luckily, the house’s owner, Alassane Alpha Sane Haidara, was at home, and when he heard that I was writing a book about Barth, he graciously let me look around the rest of the two-story residence. The house had been in Haidara’s family since his forebears bought it from Sheikh al-Bakkay after Barth’s departure. The floor plan had changed over the decades, but some of it remained just as Barth described. It was stirring to imagine him here, where he spent so much time and weathered so many threats. For much of his stay in Timbuktu he was essentially under house arrest, for his own safety. His favorite spot in the house was the rooftop terrace, where he could exercise and look out over the town. From there he could see rounded huts made of matting, squarish mud-brick houses, and a small market. To the north, towering over its neighborhood, was the earthen Sankore mosque, built in the 14th century by Mansa Musa. It had been the heart of Timbuktu during the town’s golden age of scholarship, drawing learned men from all over north Africa and the Middle East. Beyond the buildings, in every direction, was the Sahara. Much of what Barth saw remains unchanged, with the additions of cinder blocks, electrical wires, and satellite dishes. Sheikh al-Bakkay lived 25 paces from Barth’s house, cater-corner across a small square. It’s a modest place. The two men often crossed the square to discuss religion or history or the latest machinations of Barth’s enemies. The explorer made many friends during his journey, but the Sheikh was the greatest of them, partly because they spent so much time together but mostly because al-Bakkay’s open-minded curiosity and intelligence matched Barth’s. Their friendship survived many challenges both in Timtuktu and after Barth returned to Britain, where the government rebuffed his efforts on behalf of the man who had saved his life. Barth doesn’t mention the houses in Timbuktu where his European predecessors stayed, but plaques now mark these places, a nod at the bravery of the first Europeans who dared to visit–a Scot, a Frenchman, a German. Coming across these places while wandering the town is a reminder that Timbuktu once signified the far edge of the world. It was years before I learned that Timbuktu existed outside his imagination. 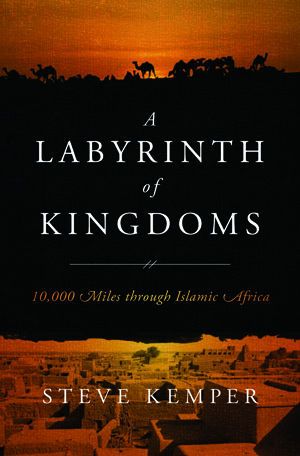 I also learned that for centuries of Western history, the imagination had been Timbuktu’s main location. The cause was probably Mansa Musa, emperor of Mali, who once ruled the city. In 1324 he made a haj across Africa through Cairo to Mecca. He traveled with an enormous caravan, including 80 camels that carried 300 pounds of gold each. Along the way he freely lightened these camels, especially in Cairo. Soon Europe was abuzz with rumors about golden cities in the heart of the Sahara. This chimera refused to die for more than five centuries, and many Europeans would die pursuing it. Meanwhile African travelers, traders, and scholars streamed through Timbuktu. A few left tantalizing reports. The restless Moroccan traveler Ibn Battuta visited around 1352 and wrote a short account that mentioned gold and many naked women. Leo Africanus, a Spanish Moor, reached the city around 1510 and was impressed by the number of scholars and gold plates. Then in 1591 the king of Morocco sent an army that conquered and looted Timbuktu, and marched its scholars to Morocco in chains. To Europe, the place seemed to go dark. After a few quiet centuries, Europe’s interest in Timbuktu reawakened, and the race to reach it was on. In 1824 the French Société de Géographie offered 10,000 francs to anyone who made it to the city and returned alive. The British were determined to beat the French. Most of the contestants didn’t survive the race. In the first half of the 19th century, only two Europeans reached Timbuktu. The first was Major Alexander Gordon Laing, who led a British expedition from Tripoli. After being viciously attacked by Tuaregs and left for dead in the middle of the desert, he somehow lashed himself on to Timbuktu, arriving in 1826. The Muslim fundamentalists who controlled the place were incensed that an infidel was polluting their holy city. After five weeks, Laing was expelled. Not far into the desert, his guides murdered him and burned his journals. A year and a half later, in 1828, another European sneaked into Timbuktu disguised as a poor Muslim traveler. His name was René Caillié, a French dreamer inspired by Defoe’s Robinson Crusoe. Everything about Caillié’s story defies belief: the years of sacrifice in preparation for the journey to Timbuktu, the horrible afflictions suffered en route and on the way home, the adulation and bestsellerdom followed by humiliation and poverty. He stayed in Timbuktu undetected for two weeks—after hearing about Laing, he decided not to dawdle—but he did return to Europe and collect the prize money, to the dismay of the British. Twenty-five years passed before another European, also in disguise, dared to enter Timbuktu: Heinrich Barth. All African explorers endured afflictions: sickness, biting insects, vile water, dangerous animals, extreme temperatures, miserable accommodations, hostile people. Throughout it all, they needed to eat. Sometimes food eased their miseries, sometimes worsened them. And of course they often went hungry. Barth’s and Overweg’s contracts with the British government required them to provide their own food. They ate well during the first part of the journey, supplementing rice and grains with the meat of hares or gazelles chased down by greyhounds or bought from hunters. In Murzuk, 500 miles into the Sahara, the pasha served them coffee and sherbet, and the British vice-consul feted them on roasted lamb and dried sardines, accompanied by rum, wine, and bottled stout. He also enjoyed the market’s roasted locusts, still a valued source of protein in sub-Saharan Africa. Barth called the taste “agreeable.” Many African explorers reviewed the dish. Friedrich Hornemann said roasted locusts had a taste “similar to that of red herrings, but more delicious.” David Livingstone pronounced them “strongly vegetable in taste, the flavor varying with the plants on which they feed. . . . Some are roasted and pounded into meal, which, eaten with a little salt, is palatable. It will keep thus for months. Boiled, they are disagreeable; but when they are roasted I should much prefer locusts to shrimps, though I would avoid both if possible.” Gustav Nachtigal also preferred them roasted. Of the dozen kinds eaten by natives, he was partial to the light-brown ones, though the speckled green-and-whites were also fine. Barth ate meat whenever he could get it, domesticated or wild. Sometimes when he stopped in a village, the chief would send him a sheep or a bullock. During his first months in Timbuktu he ate pigeons every day. In some areas guinea fowls were common. On rare occasions he ate antelope and aoudad (Barbary sheep). Barth and Overweg agreed about the tastiest meat in Africa: giraffe. They also liked elephant, though its richness tended to cause havoc in the bowels. When possible, they added vegetables such as squash or beans from legume trees to their diet, and fruit such as papayas and tamarinds. In the desert they enjoyed a refreshing drink called rejire made from dried cheese and dates. But most of the time they lived on grains, especially guinea corn, wheat, sorghum, and millet, prepared in dozens of ways—stewed, mashed, baked, roasted, rolled, fried, pancaked—sometimes mixed with milk or vegetables or bits of meat or cheese. En route to Timbuktu Barth’s typical dinner consisted of millet with vegetable paste made from tree-beans; for breakfast he mixed the cold paste with sour milk. He was fond of fura, bean cakes, and various dishes made from white guinea corn. On the other hand, in Musgu he was unable to choke down a paste made from red sorghum. During one long stretch he lived on boiled mashed groundnuts, which he grew to hate. The milk in Kukawa, however, disgusted him, because the Kanuris added cow’s urine to it, imparting a tang that he found repellent. Kanuris (and some Fulanis) still clean their milk bowls with cow urine, believing that it keeps the milk from going sour for several days. This practice nudged Barth towards camel’s milk, which he came to prefer. I’ve eaten some things considered weird by American tastes–cow’s stomach, pigs’ ears and testicles, fried grasshoppers and fresh-roasted termites, rattlesnake and blue jay, guinea pig and crocodile–all mainstream fare for Barth and other explorers, who always ate the local food. I thought of Barth in Lagos as I tried nkwobi, a dish the menu described as “soft cow leg pieces in a secretly spiced sauce, with ugba and topped with fresh utazi leaves.” So many unknowns, so irresistible. But the secret sauce covered a mass so repulsively gristly and gelatinous that I couldn’t eject it from my mouth fast enough. “Cow leg pieces” turned out to mean “hooves.” Even Barth might have hesitated. Western spellings of African names and places are notoriously various. Until all the versions of certain words became familiar to me, the discrepancies sometimes made my eyes spin (and my spell-checker run red). The causes of confusion seem clear. Imagine a panel of 17th-century Europeans—a Spaniard, a Portuguese, a Frenchman, an Englishman, and a German—listening to a Wampanoag Indian say the word that we have come to know as “Massachusetts.” Now imagine how each panelist would spell that new word after filtering its sounds through the phonics, diphthongs, diacritics, and other idiosyncrasies peculiar to his native language. It’s safe to predict that the resulting phonetic guesses would not be uniform. Similar “sounds-like” spellings occurred when explorers asked Africans the name of some river or mountain. The confusion was further complicated because different peoples in Africa spoke unrelated languages, and naturally had different names for the same places, tribes, landmarks, plants, and animals. Travelers brought all the different words home and put them onto maps and into accounts and letters. Sometimes the variations are easy to decipher. For instance, in the journals of Barth and James Richardson, and in dispatches by Foreign Office personnel, Richardson’s interpreter is variously referred to as Yusuf, Yusef, Yousef, and Youseff, with a last name of Moknee, Mukni, Muckeni, and Mokumee. The founder of Islam is likewise recognizable whether spelled Mohammed, Muhammad, or Muhammed. Things can get a bit more confusing with geographic names. In different accounts, the desert town of Murzuk, for example, is called Murzuq, Mourzuk, Morzouk, and Murzuch. There’s Timbuktu, Timbuctoo, and Tombouctou. Lake Chad also appears as Tschad and Tchad. Tribal names often undergo phonetic mutations. The Tebu people of Niger and Chad may be called Toubou, Tibbu, Tibu, Tubu, Tebou, or Tibboo. The great ethnic group who dominate the Central Sudan may be referred to as Fula, Fulani, Fellani, or Fulbe. Barth rode for a while with a tribe of mercenary Arabs, “certainly the most lawless robbers in the world,” whom he called the Welad Sliman–but other writers spell their initial name Walid, Ouled, Oulad, or Uelad, sometimes followed by Soliman, Suliman, or Suleiman. A researcher needs to recognize the many possible combinations. “Tuareg” comes in multiple alternate spellings: Tawarek (Barth), Tuarick (Richardson), Touareg (French), and Twareg, among others. The same is true for the Tuaregs’ name for themselves: Imoshagh, Imohag, Imohagh, Imashaghen, Imuhagh, Imajaghan, Imajughen, and Imazaghan are a few of the variations. The Tuaregs’ language is usually, but not always, spelled Tamasheq, Tamashek, or Tamajaq, which uses an alphabet called Tifinagh. To a researcher combing through books and encountering these peoples under all their different names, it’s as if they carry multiple passports and wear disguises, a mustache in one place, an eyepatch in another. Sometimes the disguises are confounding. Old travel accounts and histories may refer to the Niger River as the Isa, Quorra, Kworra, or Kwara. The Niger’s major tributary, the Benue, might appear under the names Shary, Shari, Tchadda, or Chadda. Such wild discrepancies also underline the unsettled state of geographic knowledge about these river systems in the 18th and 19th centuries. To make sense of old accounts and historical documents, a researcher must learn to recognize the variants. Otherwise, references will be missed or misunderstood. Someone inexperienced who searched Barth’s index for “Tuareg,” for instance, could get the misimpression that the explorer had nothing to say about that extraordinary desert tribe, when in fact he spent a good portion of his journey among them.